Fresh. Homemade. All Natural. Those are the attributes that today’s consumers seek when they shop for baked goods at a nearby fruit orchard or their local farmer’s market. Today, Lentz supplies hundreds of farm markets throughout the Mid-Atlantic region with the ingredients and products they need to operate their bakeries. Whether you bake from scratch or prefer the convenience offered by high-quality frozen baked goods from leading national brands like Gardner Pie, Guttenplan’s, Granny’s Kitchen, Bake’n Joy and Tribeca Oven, Lentz offers a complete solution for farm market bakeries. We recognize that operating the bakery is one of many aspects of running a farm or orchard and its associated market. Your growing season is limited, and you have to maximize your selling opportunity in a short time window. Your Lentz sales representative will work closely with you in the “off-season” to plan your product menu, develop a seasonal merchandising plan, and provide you with samples to help you evaluate new items. Once your market opens, your sales representative and the Lentz customer service team proactively help you manage the ordering process and react to unexpected spikes in sales. 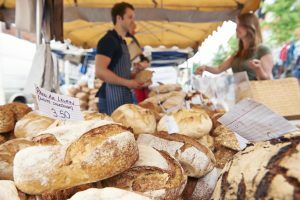 With our high standards for food safety and nearly perfect fill rate and on-time delivery performance, we go the extra mile to make sure that your market will be fully supplied with the bakery products you need throughout your busy selling season.